Challenger Lifts’ Portable Mid-Rise Lift is a great way to increase the productivity in a shop. It’s like having a service bay anywhere, indoors or out. The motor is conveniently mounted to a Heavy-Duty tow dolly, making it easy to move and operate on almost any solid surface. Exclusive features include a sliding/rotating arm design with rubber pads, low drive-over clearance, and much more. Challenger Lifts Heavy-Duty In-ground Lifts are ideal for starting or expanding your commercial fleet service capabilities. Heavy-Duty In-ground Lifts require less shop space than surface mounted lifts, maximizing the number of service bays. The CS1220 is equipped with standard, medium and high extension stack adapters to accommodate a wide variety of Heavy-Duty vehicle pick up points. Challenger Heavy-Duty In-ground Lifts are fully contained in a recycled polymer housing to protect your investment and the environment. The AV1020WV EnviroLift® with patented AquaVantage™ Technology uses compressed air and tap water instead of electrical motors and hydraulic oil, making it the most environmentally friendly automotive lift on the market, a RealGREEN™ product. No high pressure cylinders, fewer moving parts, and lifting mechanisms that are service accessible from the surface means an overall lower cost of ownership. And since it’s powered by the air pressure you already have, there are no noisy, energy-consuming motors. The moment you see its gleaming pistons rise from the floor you’ll understand why it’s a better solution to lifting. Its advantages are clear as water. 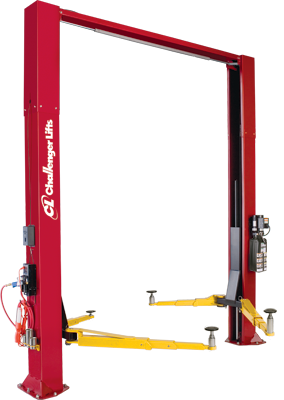 Challenger Lifts 44012LR is the best choice for a two person oil change operation. This Lube Rack is optimized for speed and efficiency. Its design allows one person to check fluids under the hood while standing on the diamond plated catwalk and another underneath, to change filters and fluids. With optional drive thru ramps and oil drain pan, the 44012LR Four Post Lift is a perfect supplement to any service facility. 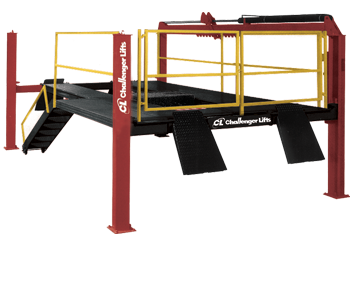 Expand your service offering and increase your revenue potential with Challenger Lifts’ 12,000 lb. four post lifts. 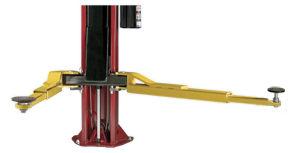 Our 40series Four Post Lift is loaded with features you would expect to pay more for, like solid piece column construction, automatic wheel stops, wheel curbs and anti-skid coating on runways to minimize slipping, etc. 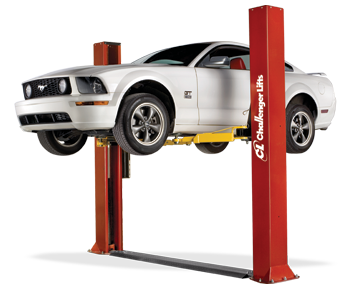 The CLFP9 two post automotive lift features a 10’ 7/8” overall column height, making it ideal for low ceiling applications. Standard front and rear 3-stage arms provide maximum arm sweep, arm retraction and reach. 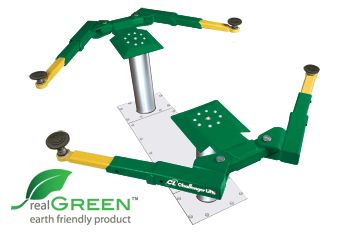 The CLFP9 two post lift will accommodate a wide variety of vehicle lifting points, including short and long wheelbase and wide body imports. 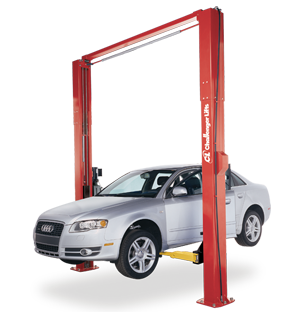 Other automotive lift features include double telescoping screw pads, durable powder coat finish, plated arm pins, and a Heavy-Duty chain and hydraulic lifting system with cable synchronization, just to name a few. Available in red and blue. 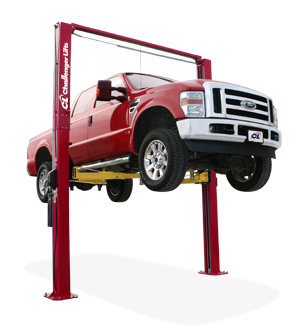 Service more vehicles and make more money with the Versymmetric® and Versymmetric® Plus CL10series two post automotive lifts. 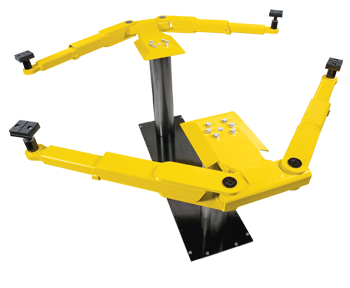 Its exclusive Versymmetric® Technology provides the versatility to safely lift cars, trucks, vans and SUV’s symmetrically or asymmetrically within the same service bay, within rated capacity. 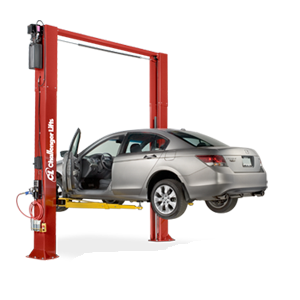 With three Versymmetric® two post lift productivity configurations – Max Plus Productivity, Maximum Productivity and Complete Productivity, adjustable height and width options, and custom color options, CL10series two post automotive lifts are the best choice for professional service facilities. CL10series three options give you more choices to find a lift that suits your needs even more. 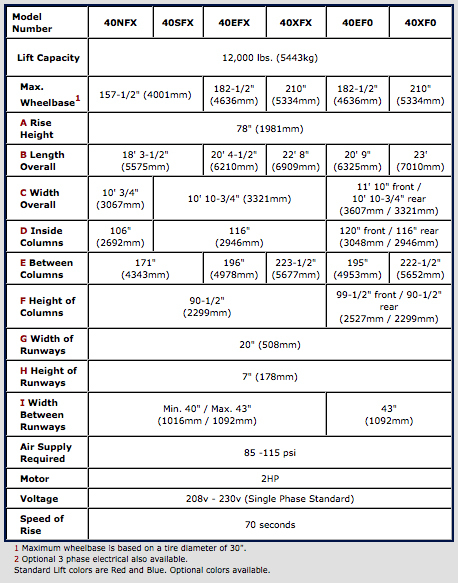 Below are bullets explaining in greater detail the differences between the three Versymmetric® 3-stage front and 3-stage rear arms. Whether you want to expand your fleet service capabilities, avoid downtime or just increase your bottom line, Challenger Lifts 12,000 lb. 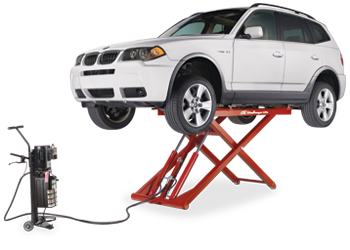 two post automotive lift is the solutions for your servicing needs. 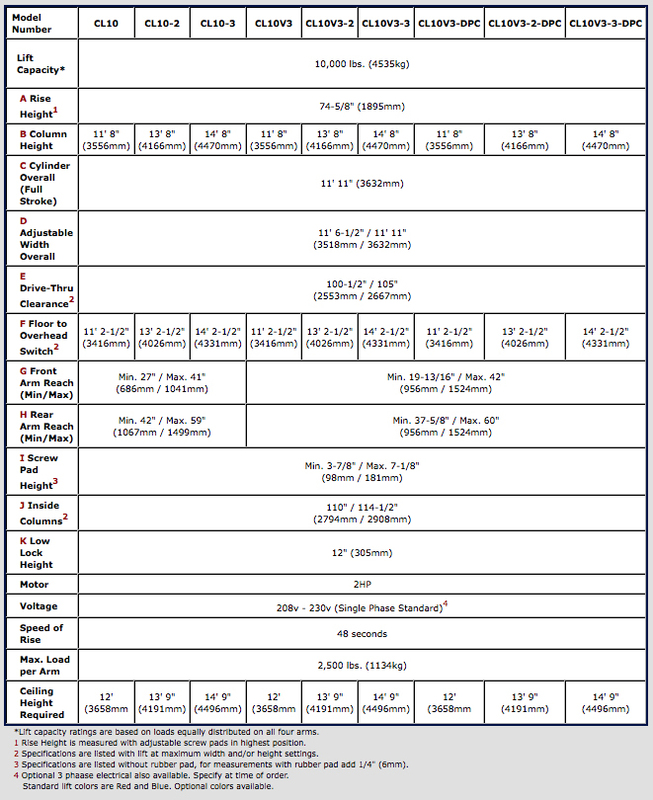 Not only does our 12,000 Heavy-Duty lift a lot, it’s a lot of lift. The 12,000 heavy-duty two post lift has features that you would expect to pay more for, like low profile arms, padded overhead cut-off bar, adapter accessories, etc. 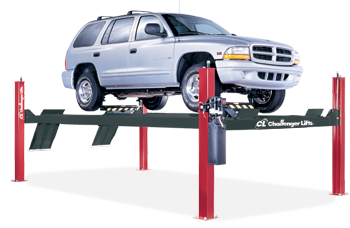 In fact, no other automotive lift company gives you more. The 12,000 lb. 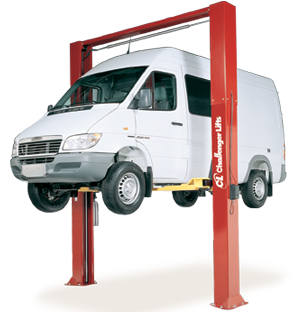 capacity E12 two post automotive lift provides symmetric lifting capability, maximum room to work underneath vehicles and room to grow. It’s adjustable height accommodates higher profile vehicles and provides ample headroom for day-to-day servicing. Other features include Heavy-Duty 2-stage telescoping arms, automatic arm restraints, rubber protective door guards, single point mechanical lock release system and padded overhead shut off system. 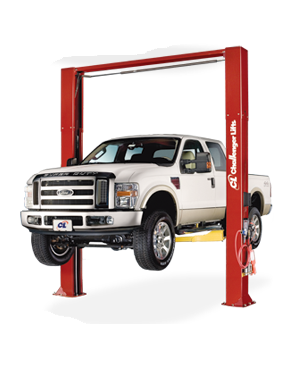 The E10 two post automotive lift features Challenger’s innovative Versymmetric® Technology, providing technicians the versatility to lift vehicles both symmetrically and asymmetrically within the same service bay. This exclusive technology facilitates increased efficiency and revenue potential. With double telescoping screw pads, durable powder coat finish, plated arm restraints and pins and many other appealing features, the E10 two post lift will accommodate the rigorous demands of a full service facility – and afford room to grow with its competitive price. Available in red and blue.